If you find me shooting, you will probably also find at least one Lowepro Toploader Pro hanging from my shoulder or attached to a Lowepro Belt I am wearing. These cases are by far my most-used. Why? Foremost, because the toploading holster-style cases offer fast access to a ready-to-use camera while providing excellent protection in a compact and comfortable-to-carry design. If you have read the Lowepro Toploader Pro 65 AW Review or the Lowepro Toploader Pro 70 AW Review, the Lowepro Toploader Pro 75 AW review will sound very familiar. These cases are nearly the same except for their dimensions. 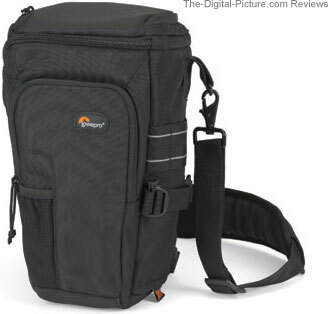 Lowepro's cases are extremely popular due to their great quality, great designs and reasonable pricing. Lowepro's Toploader Pro Cases are no exception to this rule. 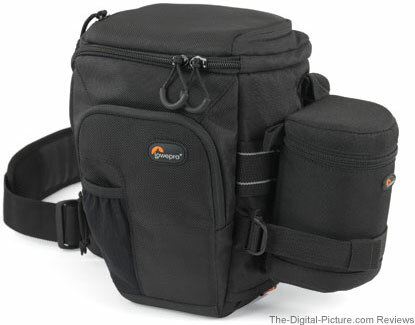 As of Lowepro Toploader Pro 75 AW review time, there are three Lowepro Toploader Pro models to choose from. The 75 AW is the largest member of this family. Use the mouseover links below to tour these models. Each case has a zippered pocket in the front. The size of this of pocket varies significantly between models with the 75 AW's pocket able to barely hold a Canon 580EX II Speedlite - the zipper barely closes with this flash in the pocket. The Canon 320EX Speedlite Flash and Canon 430EX II Speedlite Flash will easily fit. This is also a great area to store filters in their plastic boxes. An elastic mesh inner pocket will keep smaller items in place. I sometimes carry a small gray card here. the pocket is moderately padded on the outside and heavily padded against the inside of the case. A small elastic pen holder pocket is available on the outside. 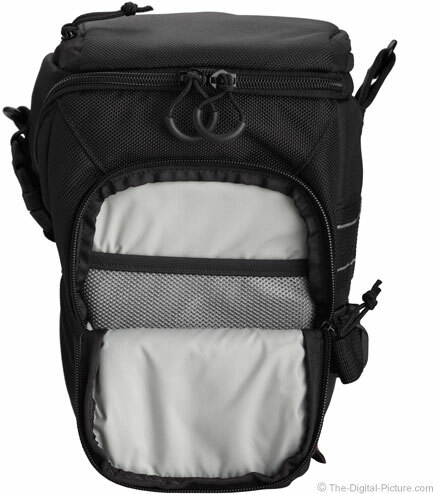 The above picture shows the Lowepro Toploader Pro 70 AW front pocket forced open wide - the 75 AW pocket is similar - but larger. The main compartment zipper pulls are visible in this shot. Note the easy-to-grip U-shaped zipper pulls - I really appreciate this design in the heat of the action. Moving to the Side 1 image above, you can see a key feature of this case: the large, strong nylon web with dual sets of heavy stitching running vertically through it. This is the Lowepro Slip Lock attachment point. 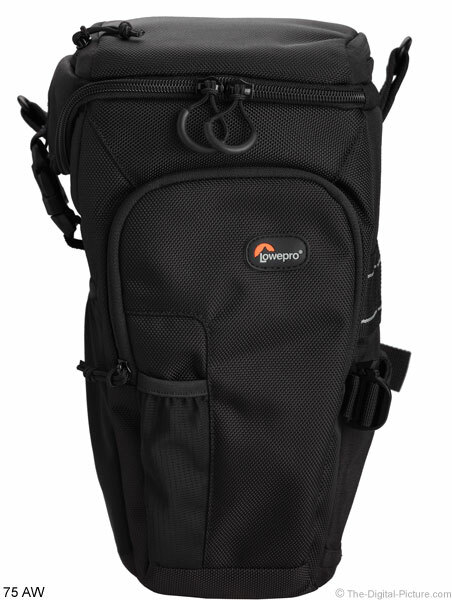 As part of the Lowepro Street and Field modular carrying system, the Lowepro Toploader Pro 75 AW accepts a huge range of accessories that attach via Slip Lock - including lens cases, water bottle holders and other general accessories. The older Lowepro Toploaders (non-"Pro" models) had two of these attachments - and I was not happy to have only one on the new Pro models. Reality is that I have not missed the second Slip Lock attachment very much - but I frequently make use of the available one. The 70 AW and 75 AW cases have a security strap that goes around a Slip Locked case as depicted in the image below. 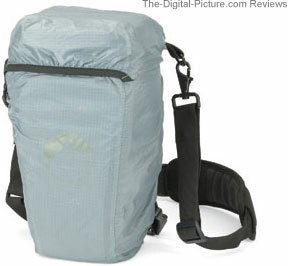 On the Lowepro Toploader Pro 75 AW back, meshed (for breathability) padding is the primary feature. The padding is primarily to protect you from what you are carrying - for your comfort. Space is provided between the mesh padding and the case to allow a photo belt such as the Lowepro Deluxe Technical Belt to pass through. Also visible on the back are four attachment rings. The top two are metal and allow quick attachment of the nicely padded (with rubberized surface on underside), adjustable shoulder strap. The shoulder strap attachment clips are metal and swivel. The four back attachment rings (the bottom two are plastic) can also be used for the optional chest harness. Or for any other use you come up with. I usually have carabiners hanging from one or both of the bottom 2 rings. When in the field, I can quickly attach whatever to these (such as a ball hat). I have not used the web buckle attachment near the top back of this case. I suppose you could use it to attach the bag to another pack. The last back feature I'll mention is the carry handle. This is a feature that has been downgraded from the prior non-Pro model. Though it works fine and is very strong, it is floppy and not as comfortable in your hand as the older, thicker design. I use the carry handle frequently, so this is not a favorable change in my opinion. The Side 2 image above shows the primary compartment buckle and zipper dual closures. Use both for the security of your gear. Opening the primary case zipper reveals the camera and lens compartment as seen below. Note that the lid opens wide and remains out of the way. Toploading holster-style cases allow cased-access to the LCD and rear-loading battery and memory card slots. The Toploader Pro's recessed area of the case lid provides easier access to the camera's grip - and allows side-located memory card slots to be cased-accessible. A smaller zipper storage area is available on the top of the case. There are two memory card holders (my CompactFlash-sized plastic cases fits snuggly in these) and an elastic mesh pocket inside. I keep a micro fiber cleaning cloth in the mesh pocket and up-to-two filters in their plastic boxes in the main top storage area of the case. I will also slip lens caps into this pocket when I put the camera into use. A large, elastic, unsecured mesh pocket is available under the buckle for your non-valuables. I would much rather have a secured pocket here - or perhaps another Slip Lock attachment point. AW = All Weather. The Lowepro Toploader Pro 75 AW is ready for the elements. Contained in a Velcro-closed hidden compartment under the orange tag seen in the Side 1 views above is a permanently-tethered rain cover. The tough 1680D Nylon PU, 600D Ripstop Nylon PU and 600D Nylon PU outer fabric will keep a lot of the elements out of the case, but the rain cover shown installed below takes the protection up a notch when your venue gets wet. I recommend that you practice installing the cover at least once before you need to use it quickly as installation takes a bit of figuring out. Don't worry - it is easy to put the cover back into its hiding place. My most recent use of the rain cover feature was while hiking the Mist Trail by Vernal Falls in Yosemite National Park as the heaviest snowpack in 75 years was melting. There is a reason the trail is so-named. We (the case and I) got soaked. The camera remained dry - when I wasn't using it that is. Not prominently shown in any pictures on this page is the removable waist strap that helps keep the Toploader close to your body when being used with the shoulder strap. Biking is one activity I like this strap for. Also not shown in this review is the included Velcro-attached padded divider for use in the main compartment. I have removed all of these from my cases, but you could store something under your camera and lens if you desired to - and had space to do so. The padded divider can be used to better-secure a smaller, grip-less DSLR. As I hinted at throughout this review, the overall build quality of this case is excellent. Thick padding provides excellent camera protection from impact damage. Inside, 210D Nylon PU, Velex PU, Brushed Tricot Nylon provide excellent, smooth, soft, non-marring surfaces for your prized and counted-on gear. Especially nice is the Brushed Tricot Nylon underside of the top lid - which rests on your camera's rear LCD. I occasionally forget to attach a lens cap when returning the camera and lens to my Toploader. Fortunately, the soft material in the case does not scratch the front element of your lens. These cases are sized to fit a DSLR with a grip or a pro-sized DSLR. Smaller DSLRs will of course fit fine - but not as tightly. The Lowepro Toploader Pro 75 AW will comfortably hold any Canon lens that does not come in a trunk mounted to a pro or gripped body with the exception of the Canon EF 400mm f/5.6 L USM Lens. this lens is too long. A Canon EOS-1Ds Mark III and a Canon EF 100-400mm f/5.6 L IS USM Lens with hood reversed will fit comfortably. This combination does not account for neck strap room behind the camera (though it would likely fit). I recommend wrapping the strap around the lens before placing the camera in the case. This technique keeps the strap off of the LCD - and allows free access to the rear of the camera - allowing the LCD to be viewed while the camera is in the case. If you have a lens that you are unsure will fit in this case, use the site's Lens Specifications and Measurements tool to compare the dimensions of the 100-400 L with those of your lens. As I said before, I use the Lowepro Toploader Pro cases a lot - often multiple at a time. I currently have 5 Toploader Pro cases - Lowepro sent me two and I purchased 3 additional cases. 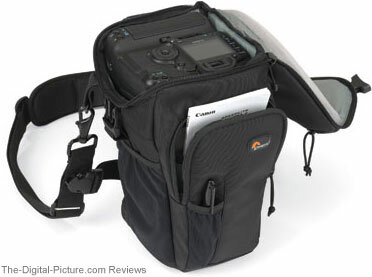 The cases can be carried over one shoulder, over a shoulder and neck (up to two cases at a time this way) or on a belt such a Lowepro Deluxe Belt (two or perhaps three at a time this way). All of these carry methods are very comfortable and frequently I am combining two of them - such as having one case around my neck and shoulder and another on the belt. When traveling by vehicle, I typically place the camera-loaded Lowepro Toploader Pro 75 AW directly in the vehicle or place it in a Lowepro S&F Transport Duffle Backpack or even in a Pelican hard case. Or I'll place it directly in my luggage. When traveling by air with lots of gear, I am typically carrying my gear in a backpack, but I always want some Toploaders to use at my destination. In this case, I will pack the Toploaders full of clothes or other supplies (especially items needing impact protection) and put them in my checked luggage. I have also stacked lid-open cases in my luggage (as long as no one else will be handling my luggage). The Lowepro Toploader Pro 75 AW is a high quality, highly protective, thoughtfully-designed case that is convenient and comfortable to use. I highly recommend this case.